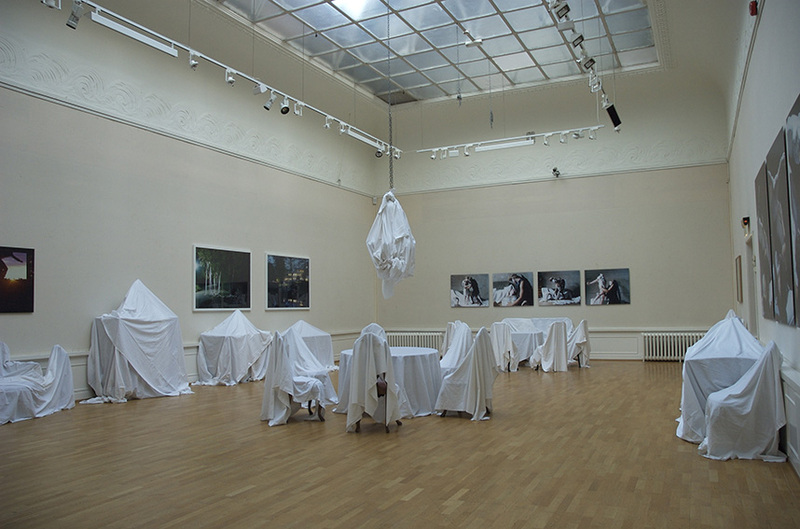 The idea of a deserted salon or drawing room formed the starting point for my 2006 installation at Blomqvist Kunsthandel in Oslo. Originally built as a gallery and auction house in the early 1900s, Blomqvist Kunsthandel is considered to be the leading auction house in Norway for dealing in traditional paintings and antiques. In this historic ambience, I wanted to put together a selection of my photographs and modify the exhibition space by adding furniture, to evoke a scene from a film or props for a costume drama. The white drapes altered and simplified the shape of the meticulously ornamented furniture, producing a sculptural appearance. The main purpose for covering furniture is to preserve it and prevent dust and deterioration. It symbolises something hidden, something waiting to be put to use and serve its purpose. The preservative aspect, also portrayed through the clearly nostalgic aesthetic of the photographs, denotes a beauty or form of expression that no longer carries any significance and force in art. ”Die Zeit entführt die Schönheit” (Time Abducts Beauty), alludes to a baroque sculpture by the Italian sculptor Pietro Balestra, which can be seen in the collection of sculptures in the ”Grosser Garten ” in Dresden, Germany. In this sculpture a winged creature, manifested in the shape of an old man, is abducting a young woman, symbolising Beauty, The drama of this narrative inspired me to reinterpret the subject through a series of photographs, which I also included in the exhibition.